Could Moving Abroad be The Fresh Start Your Family Needs? Have you always dreamed of moving to a new place in the world? While it’s a massive undertaking, it could well be the very best thing you and your family have ever done. If you’ve always disregarded or pushed aside the idea of taking the plunge because you have children, here are just a few things that might change your mind. Maybe your family has been through a tragic loss, perhaps you’ve been dealing with an issue such as bullying or mental health problems or maybe you’ve separated from an abusive partner and want to make a completely clean break. Whatever the circumstances, moving to a new country might seem dramatic but it could give you and your family completely fresh start. If living abroad is something you’ve always considered anyway, an unhappy situation could be the push you need to make the leap and do what you’ve always dreamed of. Sure, moving to a new place in the country you live could be enough for some people. But if you really want to start fresh and try something new, moving abroad could open up endless opportunities and experiences. One of the things that makes moving abroad so special is you get to experience a completely different way of life. The weather is different, the things people like to do will be different, the food, customs and much more. If you have a place in the world that you’ve always admired, moving there allows you to experience it firsthand. This can really help you to expand your mind and learn new things. Many people move to another country as life tends to be much less fast-paced. If you want to to live in a place that’s relaxing and serene and isn’t constantly on the go then making the move could be a great idea. While every country will have its areas of beauty, moving to a new place will allow you to take in brand new surroundings. Want to wake up with mountain views, in glorious countryside or overlooking a lake? Sick of making your morning commute in the pouring rain, and want to live in a place with fair, mild weather most of the year? Do you worry about the impact of pollution and busy traffic on your family? Moving to a new place could allow you to live in the beautiful surroundings you’ve always dreamed of. With things like better weather, prettier landscapes, more space, less pollution, friendly locals and stunning architecture on your list, do your research and find that offers everything that you’re looking for. Of course it won’t always be the case, but depending on where you move to, you could well get a lot more for your money when it comes to housing. Lisbon in Portugal, Saint Chinian in France and Abruzzo in Italy for example are all gorgeous destinations with low property prices. There are plenty of places in Spain where you can buy huge villas with a pool and lots of land for the price of a small apartment in a US city. If you want a lovely home with plenty of space for your children to be able to run around and play, have their own bedroom and have lots of rooms left over for a home office, a classroom, a playroom and more, moving to another part of the world could well allow you to do that. Chances are you’d need to win the lottery to be able to afford such a home in the place where you currently live. You could turn an outbuilding into a dance, music or art studio where your family could enjoy their passions. You could get horses, own chickens and other animals. If this is the sort of lifestyle you dream of, know that it can be done- for much less money than you might think! One great benefit to moving abroad (and in some cases, will be your sole motivation for moving in the first place) is that you can access better education. We all want to give our children the best start, and do all we can to give them the brightest future. Maybe the education in your area isn’t the best, or perhaps it’s simply better in the place you want to move to. If the education isn’t as good where you’re planning on moving to, you always have the option of homeschooling. Thanks to the accessibility of the internet, homeschooling has really taken off and there’s so much help available online to help you give your child the education they need and deserve. Outside of the classroom, a new country gives endless opportunities to learn. From new foods, new cultures and religion, you could take them to museums and galleries, teach them about the architecture and different buildings and really make learning unique and interesting. Whether you decide to make the move permanently or just for a few years, there’s plenty that all of the family can learn from living in a different country. As with schools, moving abroad might give you access to better jobs and allow you to advance your career. But again, even if this isn’t the case it doesn’t mean you need to give up on your dream. It’s perfectly possible to earn a fantastic living working online these days, and you can do so from anywhere in the world. You could work remotely for a company doing anything from marketing to reception work. You could write a blog or start a Youtube channel and monetise your content. You could work as a freelancer, there are lots of sites out there that bring together freelancers and content creators so it’s easy to find work. You could even run a home business, there are plenty of ideas that don’t cost much to get started but could allow you to earn a decent living. You will of course need to get everything set up and established before you move away. You’ll need to know that your income is stable before you move so that you can support yourself at the new destination. Even if you plan on finding a job as an employee when you move, consider these as side hustle ideas for your spare time. That way you have an additional source of income just in case you need the extra cash. Moving abroad is a massive decision, something that will affect you and your family in a big way. If it’s been a tough situation that’s spurred on the move, don’t make any decisions while you’re still hurting. Wait until you’re completely calm and have thought all of the details through carefully. One tip would be to go and stay for a month, companies like Interhome.co.uk rent out villas and holiday homes which would allow you to get a feel for what it’s like in the country you’re planning on living in. You could view homes while you’re there, check out schools and children’s activities, chat to the locals and generally get a really good idea about what the place will be like before taking the plunge. Bear in mind that real life won’t be like being on vacation, so do all of the normal things you would do. Cooking, cleaning, washing, organising and more. Bear in mind how the move will affect loved ones back home, and talk it through with those you’re close to. You need to make the right decision for you and your family. Don’t let them put you off, but do listen to their points. Moving away from those you care about can be hard, but communication is easy these days with things like video chat and social media. And you can still visit each other, and make a nice vacation of it! You don’t have to be confined by the country you grew up in. You don’t have to pay high rents or property prices on sub-par homes, in areas rife with crime and pollution. You don’t have to live in cramped surroundings, just because that’s all you can afford in the area you currently live in. Moving abroad definitely won’t be for every family. If you have strong ties to your job, your children are in the schools you want and you’re very close to your loved ones then uprooting to a brand new place wouldn’t make sense. But if you’re after a fresh start, crave adventure or are seeking a different kind of life then it’s something well worth considering. Maybe your plan is to move for a year, five years or permanently- but if you give it a go you’ll more than likely be glad you did. Even if you return back home eventually, think of the experiences you’ll have gained and the things you’ll have all learned. 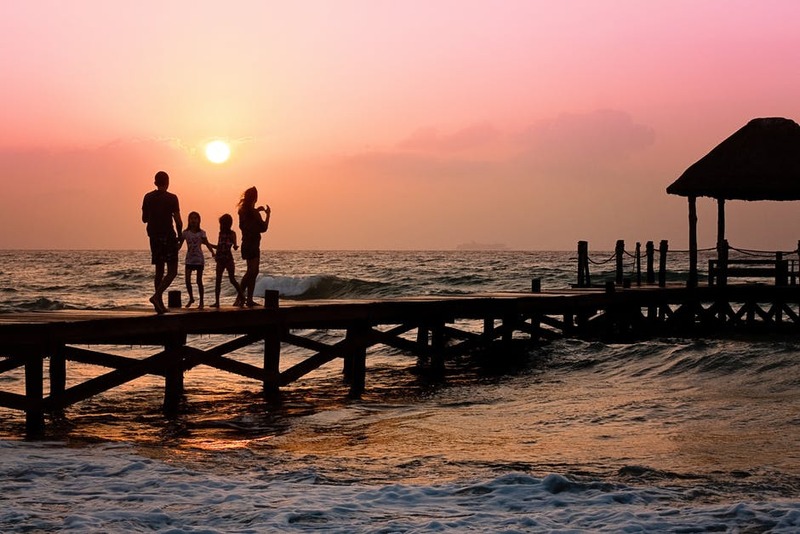 Have you ever considered moving abroad, and is it something you’d ever do with your family? What places in the world would you be most likely to go for?